If you thought that global warming was bad enough now, just wait. I was following up an article at WUWT (archived here), where deniers seem to have discovered for the first time that sulphate aerosols have a cooling effect. I thought they'd have known that by now, but no. More on that below. In doing so, I found a new paper at GRL, which is a bit of a worry. The paper is "Drivers of decadal hiatus periods in the 20th and 21st Centuries" by Nicola Maher, Alexander Sen Gupta and Matthew H. England from the University of New South Wales. The scientists figure that there won't be too many hiatus in surface temperatures after 2030, even if there's a large volcanic eruption. It's just going to get a lot hotter, and a lot hotter still if we don't cut CO2 emissions. The latest generation of climate model simulations are used to investigate the occurrence of hiatus periods in global surface air temperature in the past and under two future warming scenarios. Hiatus periods are identified in three categories, (i) those due to volcanic eruptions, (ii) those associated with negative phases of the Interdecadal Pacific Oscillation (IPO) and (iii) those affected by anthropogenically released aerosols in the mid 20th Century. The likelihood of future hiatus periods is found to be sensitive to the rate of change of anthropogenic forcing. Under high rates of greenhouse gas emissions there is little chance of a hiatus decade occurring beyond 2030, even in the event of a large volcanic eruption. We further demonstrate that most non-volcanic hiatuses across CMIP5 models are associated with enhanced cooling in the equatorial Pacific linked to the transition to a negative IPO phase. If you're around much after 2030, best plan ahead. You can look forward to unrelenting warming with maybe a little relief every now and again (relatively speaking) from negative IPO phases or a big volcanic eruption. 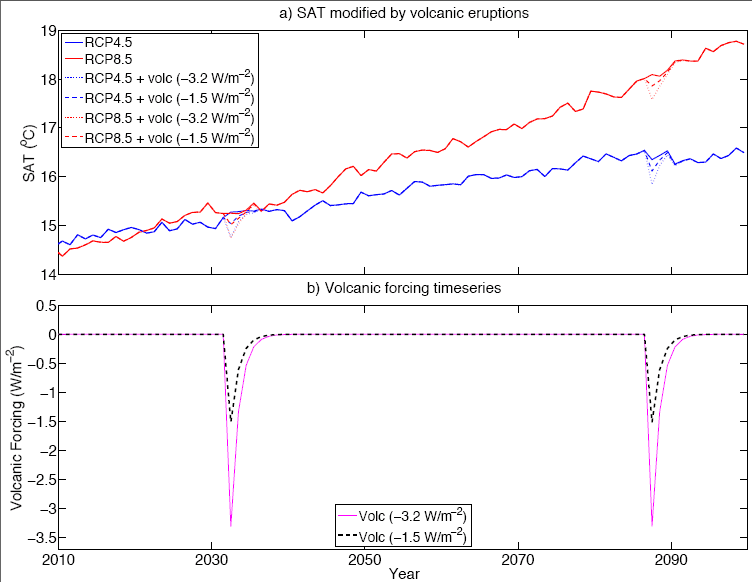 Below is a figure from the supporting information, which shows the projected effect of volcanoes on the surface air temperature based on the Access 1-0 climate model. Barely a blip, even if there were an equivalent of Krakatau. SAT (surface air temperature) for the RCP4.5 (blue) and RCP8.5 (red) future scenarios in the ACCESS1-0 model. The effect of two different sized volcanic eruptions, Santa Maria size (dashed lines) and Krakatau sized (dotted lines) if they occurred in 2032 and 2087 are shown. b) Artificial annual radiative forcing from two volcanic eruptions in 2032 and 2087, Santa Maria (dashed black) and Krakatau (purple) sized. This finding is consistent with the work that was done over the past couple of years by Feulner and Rahmstorf in 2010 and by Meehl et al in 2013, on the effect of a grand solar minimum. Both papers found that there'd be minimal impact on global warming. There are some similarities with the article referred to at WUWT except that was about human interference by way of first dirtying the air and then cleaning it up, rather than aerosols from volcanoes. The paper was also in GRL and was by Pierre Nabat, Samuel Somot, Marc Mallet, Arturo Sanchez-Lorenzo and Martin Wild. What they found was that reduced sulphate aerosols resulted in 23% of the warming and 81% of the brightening in Europe between 1980 and 2012. The interesting thing was that this seemed to come as a surprise to Anthony Watts and his crew. His rather odd headline was: "The law of unintended climate consequences at work – study says 23% of warming in Europe since 1980 due to clean air laws". Seems like he didn't know that sulphate aerosols are a cooling force. It was almost as if he'd rather have dirty air than global warming. Well, it's not really odd given that WUWT rejects science. Still, you more commonly read that sort of nonsense in the comments rather than in the main article, unless the main article is by ratbags like Tim Ball or Christopher Monckton. But…but…but… I was told (obsessively, I might add) that the sun had nothing to do with Temps! How can less pollution leading to more sun lead to higher temps if the sun has nothing to do with temps? So now they want dirty (real) air! It is not enough to just starve all the poor and freeze them. They have to pollute the planet to save it. Let’s not forget that in the UK (at least) the Clean Air Act led directly to the replacement of millions of domestic coal fires with much-more efficient gas fires. That ensured far less CO2 & ‘waste’ heat being dumped into the atmosphere. The net change was probably not proportional across Europe, but did the report’s writers factor that into their model? So shutting down all the coal fired power stations will lead to more warming. "If you're around much after 1930 ...". I make that mistake sometimes too :) Please delete this after use. Is this the same model that went for an 80% chance of above average temps for June to August? Yes it is in fact...wonder how that turned out? I don't know what you are talking about but if it's as you say, then it clearly worked out very well. Not just June to August. There hasn't been *any* month below the respective twentieth century average global surface temperatures for said month since February 1985. Not only that, according to NOAA, May and June this year have been the hottest May and June on record. ...The combined average temperature across global land and ocean surfaces for June 2014 was record high for the month, at 0.72°C (1.30°F) above the 20th century average. This surpasses the previous record, set in June 1998, by 0.03°C (0.05°F). Nine of the ten warmest Junes on record have occurred during the 21st century, including each of the past five years. June 2014 also marks the second consecutive month with record high global temperatures. If you meant something different, then post a link to the source of your strange comment, and someone might be kind enough to help you understand it. Best if you explain which model you're referring to as well. Climate models aren't weather forecasts. Another thing, even if you did get a bit confused and are referring to a medium term forecast rather than a climate projection, July and August data for this year isn't in yet, for reasons that should be obvious. It's been a cool summer in the US midwest and in Ontario and the populated bits of Quebec. Maybe anon thinks that is the whole world?